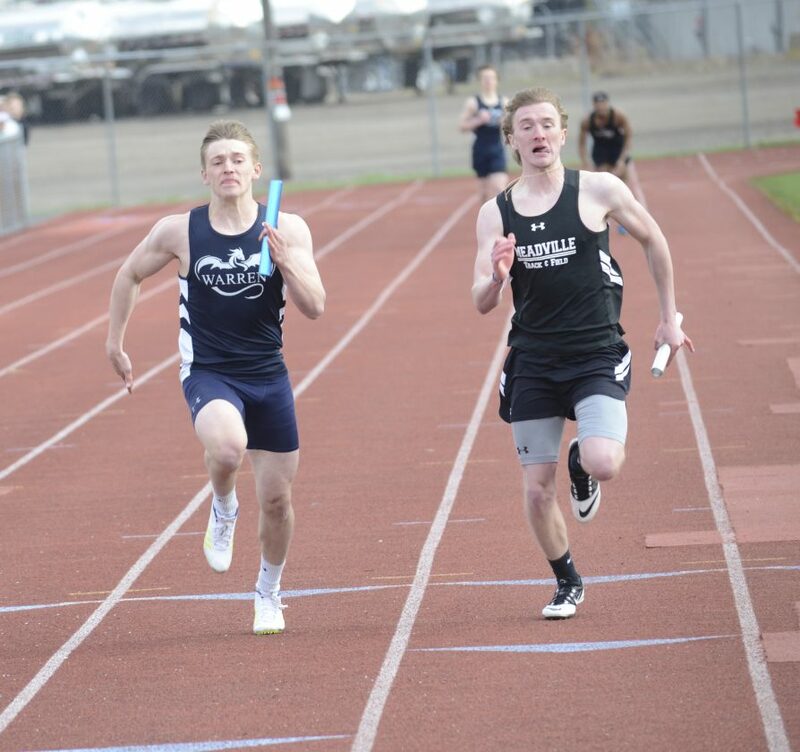 Warren’s Nathan Edwards (left) runs the anchor leg of the 4x100 relay at War Memorial Field, edging Meadville for the victory. Edwards, Kyle Adams and freshmen Aiden Sibits and Ben White ran a District 10 qualifying time of 45.96. On a sunny, albeit windy day at War Memorial Field, the Warren Area High School track and field teams got their season started. The girls came excruciatingly close in a 72-69 loss to Meadville, while the boys fell by a 91-50 score. 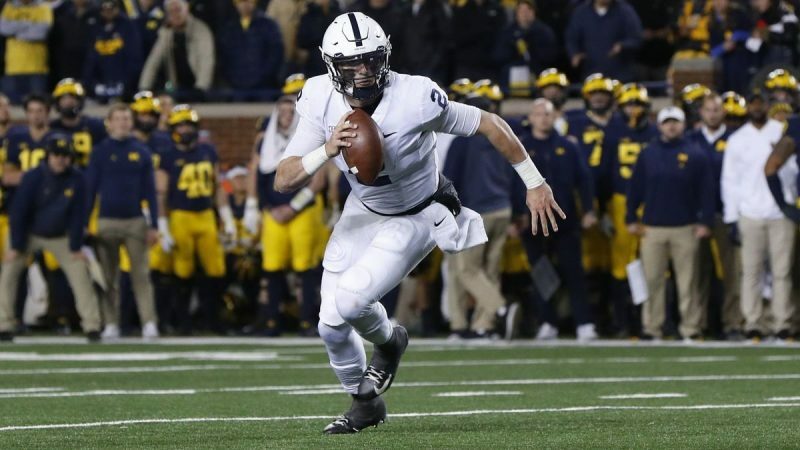 There were a number of impressive performances, however. A big strength of the girls team is once again the distance runners, and they showed why on Tuesday. 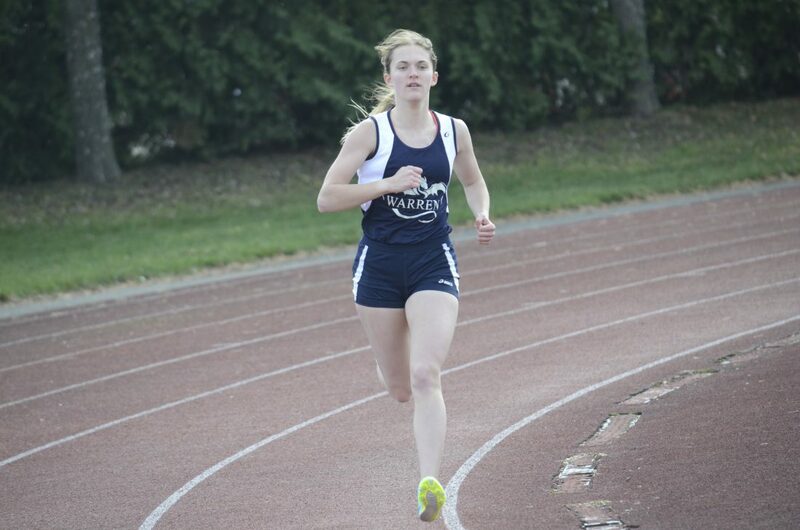 Naomi Hahn raced to victory in the 1600 and 3200, while Bri Ristau took first in the 800 and Kayla Giambrone took second in the 1600 and 3200 and third in the 800. That trio also teamed with Katie Beyer to win the 3200 relay, while Hahn, Ristau, Beyer and Lydia Latimer won the 1600 relay. 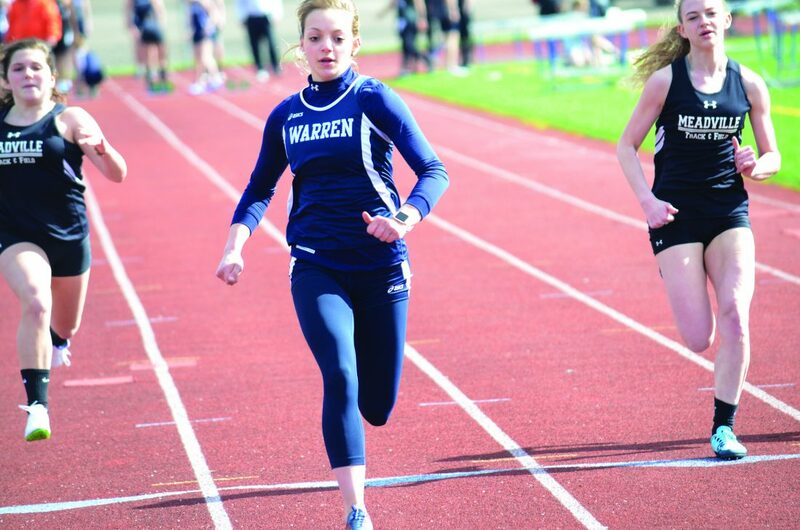 Warren’s Naomi Hahn races to victory in the 1600 on Tuesday at War Memorial Field. 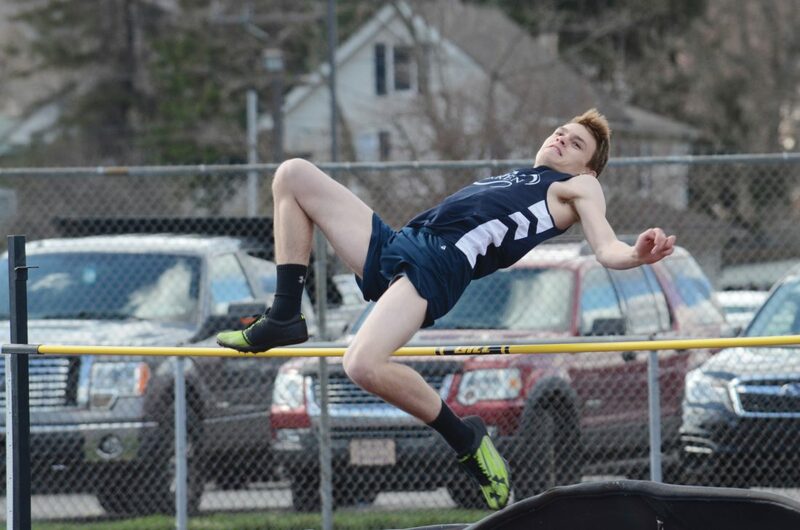 Latimer, the 3-time defending District 10 high jump champion, won that event, while Beyer and Jordan Sitler made it a clean sweep for the Dragons. 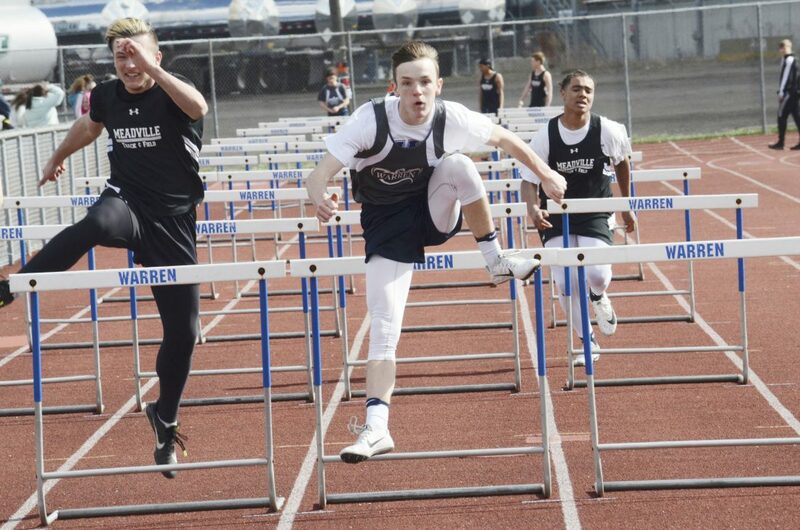 Sitler added a pair of second places finishes in the 100 and 200, the latter of which was a photo finish, while Trinity Wennberg took second in both hurdle races and third in the 100. The boys sprinters shined, led by Nathan Edwards and Kyle Adams, who won the 100 and 200 respectively. Those two teamed with freshmen Ben White and Aiden Sibits to turn in an impressive performance in win an exciting 4×100 relay. 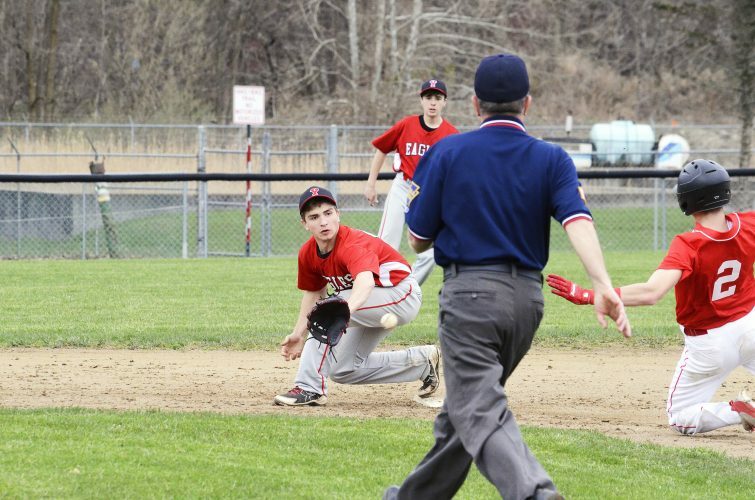 Adams also had impressive jumps in the long (20-7) and triple (40-3.5), finishing second in both to Meadville standout Hayden Parks. Jared Bupp won the 110 hurdles and finished second in the 300 hurdles. Trinity Wennberg had a strong day for the Warren girls. Warren's Jared Bupp wins the 110 hurdles. 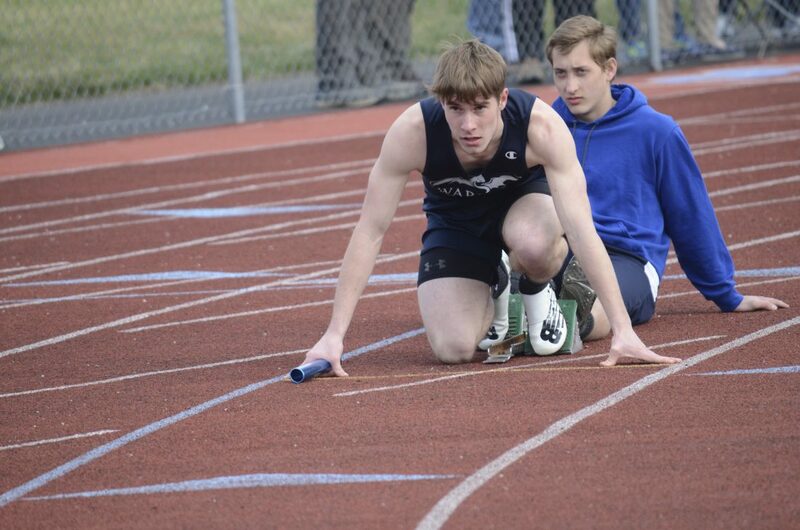 Kyle Adams sits in the blocks before the start of the 400 relay. 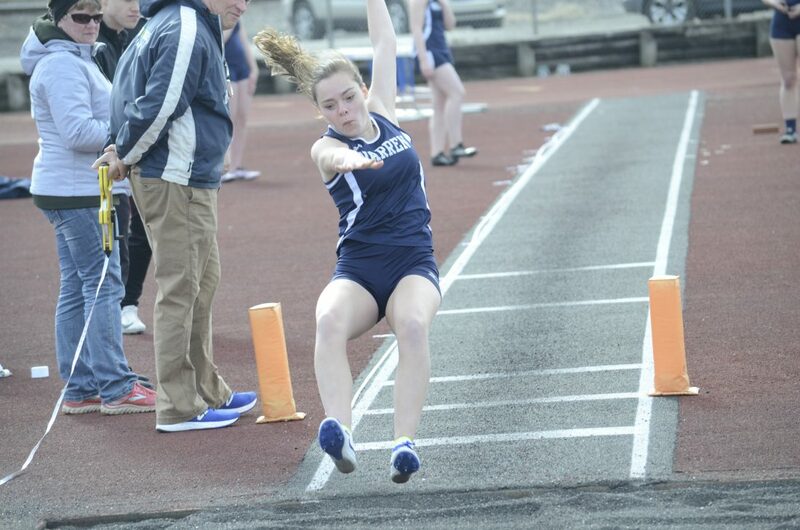 Aubrianna Navaroli competes in the long jump.